You'll be £20.00 closer to your next £10.00 credit when you purchase The Pope's Army. What's this? For much of its 2,000-year history, the Roman Catholic Church was a formidable political and military power, in contrast to its pacifist origins and its present concentration on spiritual matters. The period of political and military activism can be dated to roughly between 410, when Pope Innocent I vainly tried to avert the sack of Rome by the Visigoths, and about 1870, when Pope Pius IX was abandoned by his protectors, the French Army, and forced to submit to the new Italian state by surrendering any political power the Vatican had left. During those centuries, the popes employed every means at their disposal, including direct military action, to maintain their domains centred on Rome. Some pontiffs, such as Alexander VI, Julius II (15th century), plus the energetic Borgia popes later, built the Papal States into a power in their own right. In the following century and a half, Europe’s destructive religious wars almost always had a papal component, with the Lateran and later Vatican fielding their own armies. Climaxing the story are the little-known yet bitter late-nineteenth century battles between the papal volunteers from all over Europe and America, and the Italian nationalists who ultimately prevailed. 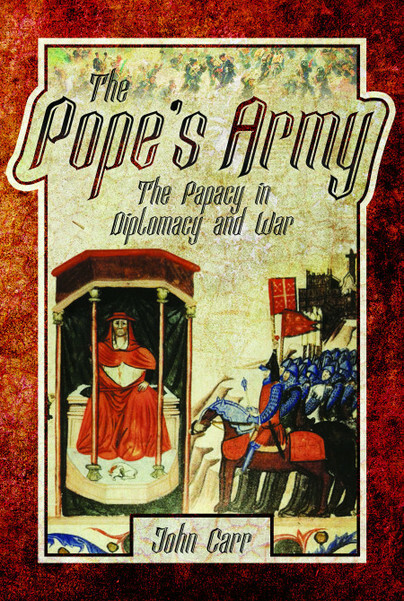 John Carr narrates the story of Papal military clout with engaging verve.